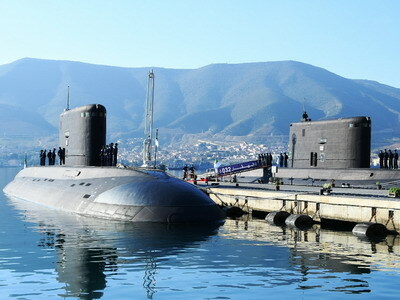 The Algerian Navy has commissioned into service two new Kilo class submarines delivered from Russia, the Ouarsenis and Hoggar. The vessels were commissioned on 9 January at the Mers El KÃ©bir naval base in Oran by the Deputy Minister of National Defence, Chief of Staff of the National Popular Army, Lieutenant General Ahmed GaÃ¯d Salah. Ouarsenis (031) and Hoggar (032) are part of a 2013/2014 order for two new Project 636 Varshavyanka (Kilo class) vessels from Russia. It is believed the first vessel arrived in Algeria around mid-2018 and the second (032) in December after completing a transit from the Admiralty Shipyard near St Petersburg, which it left arond 26 November. Algeria in 2006 ordered two Project-636E (Kilo) submarines in a $400 million deal. These were delivered in 2010 and jointed two Project 877EKM Kilo diesel electric submarines, which Algeria received in 1987-1988. The latter two were upgraded by Russian shipyards. In 2014 Algeria ordered another two Project-636E submarines for delivery around 2018. Also ordered were TEST-71 torpedoes, according to the Stockholm International Peace Research Institute. The Project-636 Varshavyanka (Kilo) class is mainly intended for anti-shipping and anti-submarine operations in relatively shallow waters. The tear-drop hulled submarine is 72.6m long, 9.9m wide and can dive to 300 meters. The design has a displacement of 3 076 tons. Underwater, it reportedly has a speed of up to 25 knots. The complement is 52 and the submarine has an endurance of 45 days. The boat is fitted with six 533 mm torpedo tubes and carries up to 18 homing or wire-guided torpedoes, or 24 AM-1 mines. The type can also be fitted with four Kalibr cruise missiles. The outer hull is covered with sound damping tiles and its machinery as well as design is regarded as very quiet. Designed by the Rubin Central Maritime Design Bureau of St Petersburg, the type entered service in 1982. The type was originally built at the Komsomolsk shipyard and lately by the Admiralty Shipyard in St Petersburg. It is in service with the navies of Russia, China, Vietnam, Iran, India and Poland, among others. Some 50 have been built. Algeria has apparently also ordered two additional Kilo 877EKM vessels, for delivery in 2020-2022.